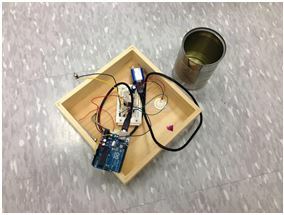 Our first round of prototypes consisted of two response devices: a makey-makey connected to various objects controlling sounds on patatap.com, and a card game that simulated wave propagation by means of the exponential growth of a rumor spreading. The students verbally expressed enjoying both games, however their non-verbal reactions to the Makey-Makey were more profound. This confirmed for us that the students would respond better to an electronics based system with audio and visual stimulation. Our next round of prototype response devices were more focused. Based on the feedback from the first round of testing, as well as speaking with the teacher, we determined that a device dealing with waves, the different types, their propagation, etc., would be most beneficial to the students. We brought four different devices for the students to play with. Two of them were simply speakers placed in containers so that they rested on the lids. 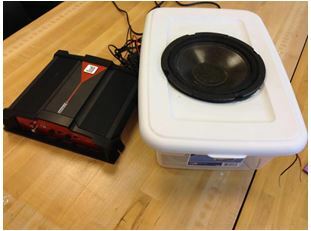 One of these was a larger sub-woofer attached to an amplifier and an iphone; the other consisted of two smaller speakers connected to a laptop through an arduino. The device with the smaller speakers also had two potentiometers, one for each speaker. These allowed the students to control the volume of each speaker independently. Our third response device was a contact speaker. 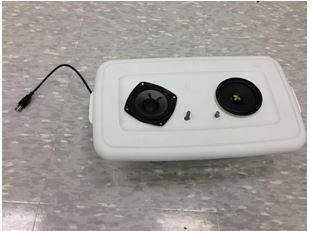 This used an arduino and piezo disc to turn any object into a speaker. The fourth and final device was a simple trough filled with water. The students agitated the water using different objects (a rock, their fingers, etc.) at different parts of the trough and then timed how long it took the waves to traverse the trough. Although we initially determined that the students would respond better to an electronic device with audio and visual stimulation, we brought the trough because it had a more obvious connection to waves; the waves produced were larger and more visible, whereas the waves produced by the other devices were either small (the simple Speaker devices) or not visible (the Contact Speaker). Despite this device having more transparent learning outcomes, the students still responded better to the electronic devices, especially the Large Speaker device. We were able to make the waves produced by these speakers visible by placing objects (small Play-Doh balls, plates of jello, etc.) directly in the speakers. Another notable piece of feedback from the students was that the more “destructive” or strongly visible the device behavior, the more they enjoyed it. This piece of information was crucial to our next, and final, round of prototype testing.